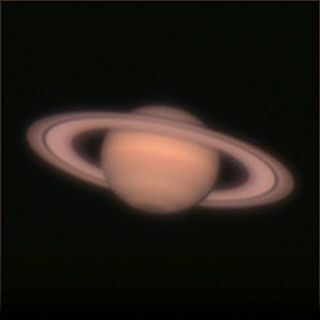 Astrophotographer Tony Sharfman sent in a photo of Saturn taken in Cranford, NJ, May 20, 2013. On Tuesday (July 16), Major League Baseball's All Star Game will be played at Citifield in New York, but the baseball diamond won't be the only place to see stars that night. Two of the “All Stars of the Night Sky” will stage a celestial rendezvous, not just above Citifield but wherever the sky is clear. Using a telescope with just small optical power (magnifications of 20 to 40 times) or even with good binoculars, you can then see a wealth of detail on its surface. Around those times when the moon is half-lit or gibbous phase, those features lying close to the terminator — the line separating the light and dark part of the moon — stand out in sharp, clear relief. If you look above and slightly to the right of the moon on Tuesday evening, you’ll also see a rather bright, non-twinkling "star" shining sedately with a yellowish-white glow. The distance between the moon and this "star" will measure just a little more than 4 degrees. Since your clenched fist at arm’s length measures about 10 degrees, the separation between the moon and the celestial object will be less than half a fist. But that "star" is not a star at all, but the showpiece of the solar system: the planet Saturn. Saturn is high in the western sky at just after sunset, and sets around midnight. Saturn is beautiful through a telescope. Saturn's magnificent ring system, the banded globe, and its faintly shimmering moons make Saturn an object of exquisite beauty. The most dramatic aspects of the planet are of course, the rings; there is nothing else like them in the sky. Any telescope magnifying more than 30-power will show them. A 4-inch (10-centimeter) telescope at 100X or an 8 inch (20 cm) telescope at 200X will provide a memorable view. The rings consist of billions of particles ranging in size from sand grains to flying mountains, which are made of — or covered by — water ice. This would account for their very high reflectivity. The reason that "rings" is plural and not singular is that gaps of brightness differences define distinct sets of rings. On the night of their "All Star get-together" the moon will be about 231,000 miles (372,000 km) from Earth. Saturn on the other hand, will be about 3,865 times more distant, at 893 million miles (km) away. Ever since the All Star Game has been played at night (the first after sunset affair was in 1943 at Philadelphia’s Old Shibe Park) there has never been any kind of noteworthy celestial event that has coincided with the game itself. In 1972 a partial eclipse of the moon occurred on the same night as the All Star Game, but it didn’t begin until after the contest was over. Weather permitting; Tuesday’s moon-Saturn conjunction will be visible to fans with a good line of sight at Citifield. And, if FOX television producers so choose, the potential exists for television viewers to get a glimpse of the cratered moon and the famous ringed wonder. The moon-planet duo could, in fact, serve as a periodic diversion from the ball game. Should the local weather be clear in that night, television cameras might be trained skyward (perhaps during a pitching change?). It could also give people in parts of the country that might be plagued by cloud cover a chance at getting a brief view.